At the June 3rd meeting, The Farmington Historical Society will feature Jean Davenhall, as guest speaker. 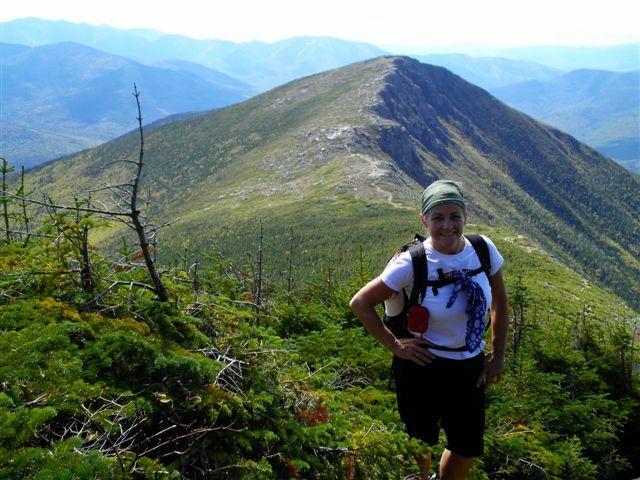 Jean is a lifelong Farmington resident whose passion for hiking and the outdoors led her to recently complete climbing The NH 48 Four Thousand Footers, a list of New Hampshire s mountains reaching 4,000 feet or more in elevation. Jean's interest in the outdoors includes not only hiking but skiing (alpine, Nordic and water), snowshoeing, kayaking, running and bicycling. Jean s adventures in the outdoors have included skiing Tuckerman s Ravine for many years with her ski buddies, snowmobiling 1,700 miles around the Gaspe Peninsula in Eastern Quebec, Canada, skiing out west as well as kayaking many NH rivers and lakes. Her first trip to the summit of Mt. Washington was in 1996 when she had the opportunity to run in the Mt. Washington Road Race. She reached the summit in 2:08! Jean also ran the Nute Ridge Half Marathon several times! 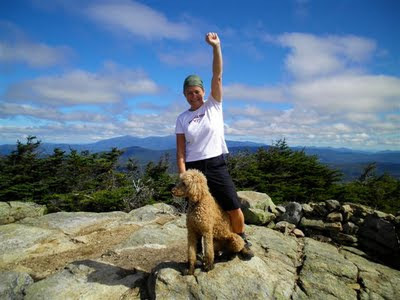 Jean Davenhall and her dog Ava on top of Mt. Bond, one of the 4,000 footers. Jean is our Hist. Soc. speaker for June 3. She and husband Tom have climbed all of the NH 4,000' and Ava the dog has done over 20 of them. Along with some of her wonderful photos, Jean will also be showing the gear one needs to hike the White Mountains. Another picture of Jean on Mt. Bond. This talk will be appropriate for all ages and a great intro for anyone who has never done any serious hiking but would like to. The presentation will be open to the public. A meeting of the Farmington Historical Society will follow the presentation. Membership dues are $5.00 annually. Come join us!